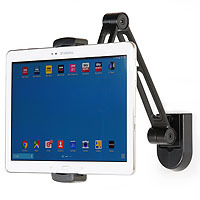 Tablet and smartphone mounts for various home and commercial applications. 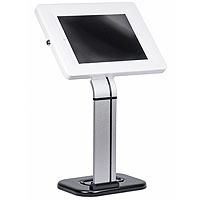 A range of tablet and smartphone mounts for many applications, including lockable desk stands for retail, microphone clamps for the musician, plus wall mounts for the home or office. 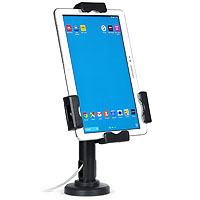 iPad or 10 inch Tablet PC Secure Desk Mount Stand PAD1503W A lockable desk mounting stand for an iPad and most 10 inch Tablet PC's. This secure enclosure with cable management through the stand is perfect for showrooms, exhibitions, EPOS and retail kiosk applications. Lockable iPad Tablet Desk Mount Stand or Wall Case PAD2102 A lockable desktop stand or wall mount for an iPad 1 2 3 or Air, plus most 7.9-10.1 inch Samsung Galaxy and similar tablets. 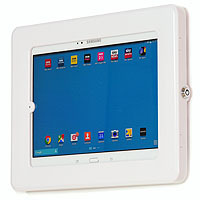 White Lockable Tablet Wall Mount Case for iPad or 10 inch Tablet PAD1504 A lockable wall mounting case for an iPad and some other 10 inch Tablet PC's. This secure enclosure is perfect for showrooms, exhibitions, and retail applications. Colour: White. 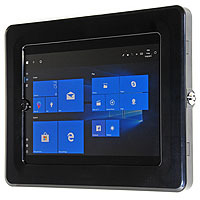 Black Lockable Tablet Wall Mount Case for iPad or 10 inch Tablet PAD1504B A lockable wall mounting case for an iPad and some other 10 inch Tablet PC's. This secure enclosure is perfect for showrooms, exhibitions, and retail applications. Colour: Black. Wall or Under Cabinet Mount Bracket or Desk Stand for iPad or 10 inch Tablet PAD2802 An adjustable wall or under cabinet kitchen mount for iPad, iPad Mini, iPhone, plus most 4.7-12.9 inch tablets. Tilt, swivel and reach adjustment. 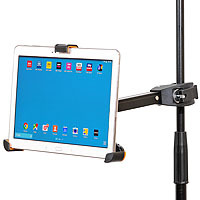 Microphone or Music Stand Mount for iPad or 8.9-10.4 inch Tablet PAD405 This adjustable mount is suitable to clamp an iPad plus most 8.9-10.4 inch tablets to a music or microphone stand.